The conservation status of cheetah in Africa is listed as threatened, however in some areas in South Africa and neighbouring countries, cheetah are still getting regularly removed by farmers with little knowledge of the genetic development of the species in the area. It took 4 million years of evolution for the cheetah to become the exceptional animal it is today and only 100 years for man to put it on the endangered list. At the turn of the 20th century an estimated 100, 000 cheetahs roamed throughout Africa, parts of the Middle East and Central Asia. Today there are less than 7000 cheetahs left in the wild and South Africa is home to fewer than 1,000 of these majestic cats. Gondwana offers 11 000 hectares (27 181 acres) of open country that provides perfect habitat and facilities for a sustainable cheetah population. Gondwana’s electrified perimeter fence (2,4 meters high) protects the species from the surrounding farms and creates a haven for animals within its boundaries. The reserve, removed from poaching or legal hunting provides the perfect area for these cheetah to have the natural freedom they require. Gondwana’s habitat consists of Fynbos, renosterveld, wide nutrient rich valleys covered in Acacia Karroo thickets, and many previously cultivated lands creating thousands of hectares of suitable plains throughout the reserve. The ability to provide sufficient diet is mandatory, and the reserve supports key prey species for Cheetah such as; Red Hartebeest, Impala, Bushbuck and Ostrich. The GCF’s main objective is to develop a sustainable breeding program of free roaming Cheetah in the Western Cape. The aim is to establish a population of cheetah who can co-exist with lions, be fence respecting, and who are tourist habituated. Zera, and another younger female Zimbini, will form the initial population together with two male cheetah residing on Gondwana Game Reserve. They have been released into a transitional 500-hectare section of the reserve (fenced off from the lions) to establish their wild hunting progeny. These cubs will then be introduced onto Gondwana Game Reserve. Effective population management necessarily requires collaborative input from a wide range of stakeholders, and strong coordination is essential to ensure that conservation targets are met. A meta-population approach has been recommended to address key issues caused by the fragmentation of cheetah populations that can facilitate the safeguarding of genetic and demographic integrity of the species thereby ensuring the long term persistence of this threatened species. The Gondwana Conservation Foundation (GCF) is committed to and, passionate about conservation. One of our key projects is our cheetah re-wilding program. In this video we introduce you to Zulu, a male cheetah in his prime waiting to be re-wilded. Although this process has already started, Zulu has encountered some physical challenges that need urgent attention. Zulu has a bone fragment in his shoulder that will prevent him from ever hunting unless it is removed. 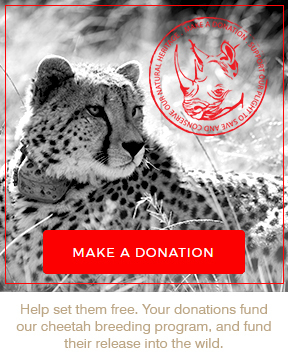 The Gondwana Conservation Foundation is looking for like-minded people to financially contribute to the cheetah re-wilding program in order to assist cheetah like Zulu on their journey to becoming wild cheetah. Your donations will contribute to the veterinary care, food and release of these cheetah and their offspring. Our ultimate goal is to contribute to the meta population and to see cheetah return to the wild. There are less than 7000 cheetahs left in the wild today. We need to act now to prevent these incredible animals from becoming yet another extinct species.